In 2008-2009, there was a border dispute between Thailand and Cambodia. It was over Preah Vihear, an ancient temple that was a long-standing conflict. In 1962, the International Court of Justice awarded ownership of the temple to Cambodia. 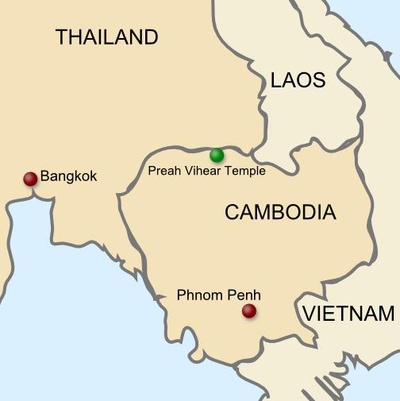 Jump ahead to March 2008, when Cambodia attempted to unilaterally inscribe Preah Vihear in the United Nations Educational, Scientific and Cultural Organization’s (UNESCO) list of World Heritage Sites. It did not consult Thailand beforehand. The Thai Government originally support to the designation and the Cambodian move. But after a Thai court ruling on the sovereignty of the matter, national sentiment turned against the agreement. It was a key issue for the People's Alliance for Democracy (PAD) or the Yellow Shirts. In 2008, UNESCO included the Preah Vihear temple in the list of World Heritage Sites. This lead to a crisis for Thailand, who deployed military troops to its border area. Cambodia claimed Thai solders crossed into Cambodian territory. Cambodian Prime Minister Hun Sen sent military troops to the area. Thai and Cambodian soldiers deployed amounted to about 480 and 800. A key legal question is based on prior claims set forth by the French, who controlled IndoChina, and the Thai government (then Siam). In 1904, Siamese and French colonial authorities in Cambodia agreed on a joint commission to demarcate border. The intent was to roughly follow the watershed line of the Dângrêk Mountains. 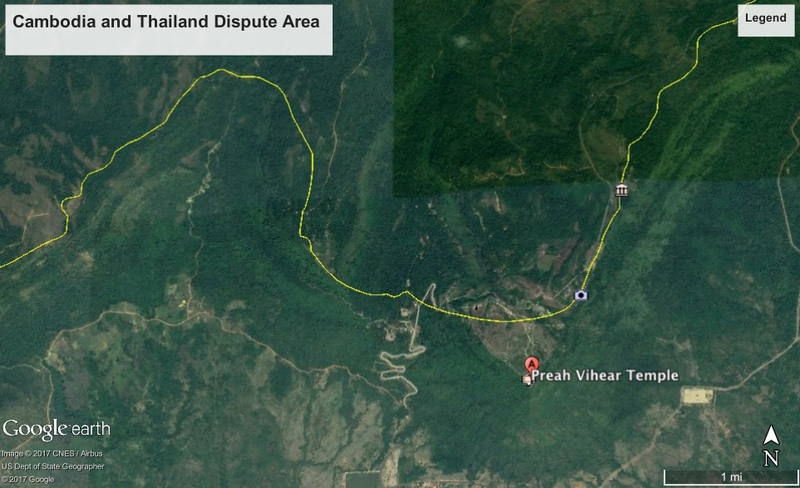 Thailand argues that these maps mis-represent water eco-system drainage; conclusions that were the basis for the line. There is some merit to their argument. It is very old Hindu temple, dedicated to the god Shiva, and built during the period of the Khmer Empire. Construction began in the 9th century and continued for hundreds of years. It was one of the last places in Cambodia to fall to the Khmer Rouge in 1975. Ironically, it was one of the last areas that the Khmer Rouge held before their demise. As they lost the battle, Khmer Rouge troops finally retreated a steps in Thailand to escape capture. Licensing: This image is in the public domain because it contains materials that originally came from the United States Central Intelligence Agency's World Factbook. This is a relatively remote area, so the conflcit may have more to do with the temple than with resources along the border. Both sides however benefitted from tourism, so the situation has become less conflictual in recent years. Conflict re-occurred in 2011, when clashes broke out in the area between soldiers from the two countries. These clashes, however, more more incidental to close military interactions than to a strategic change in direction. Direct control of border and its resources. ASEAN members have nee reluctant to intercede in the dispute. Indonesia turned down such a request. Google Maps however clearly show the temple within Cambodian territory. They are baed on U.S> State Department recognized claims.